I’m in Shiraz, the heartland of Persian culture. Shiraz was one of the most important cities in the medieval Islamic world and the capital of the Zand Dynasty from 1747 to 1779. Through its many artists and scholars the city earned a reputation for being the “House of Learning” and was synonymous with education, nightingales, poetry, roses. and at one time, red wine. 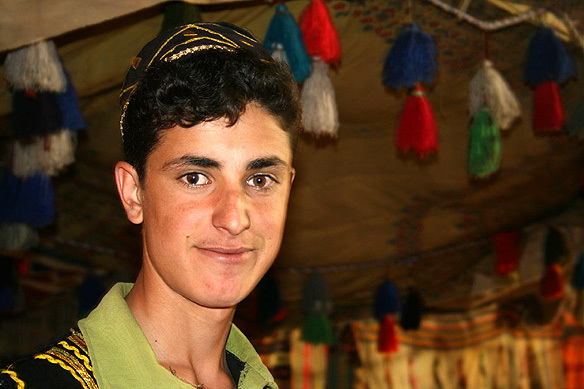 It is home to one of the oldest universities dating to the 7th Century AD. Two of the world’s greatest poets, Hafez and Saadi are buried here. 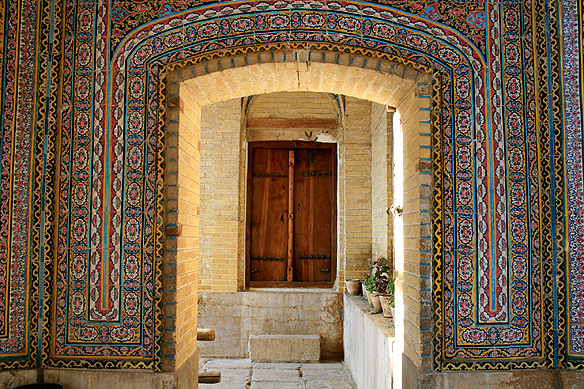 Shiraz, today, still has many charms to its credit. Beautiful pink painted tile-work, Hafez’s soulful poetry, a quiet understated sense of elegance, and a sweet fruity non-alcoholic beer which is as close as you’ll get to Hafez’s coveted glass of intoxication. But then of course one could dig deeper into the Sufi nuances and realize that Hafez is not talking about wine at all, but being drunk on our love for our Creator, and being one with Him. And twirling round and round in that love just like the world turns around. Did I get it right, Hafez? 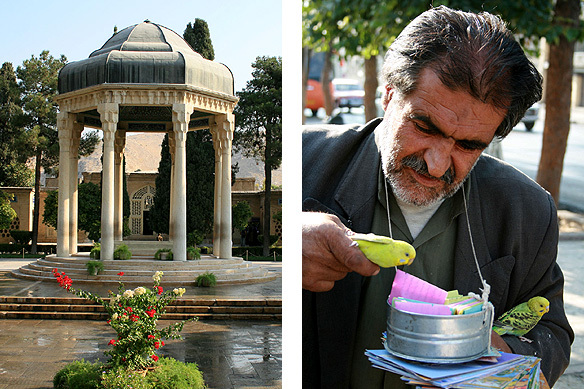 There is much to explore in Shiraz. 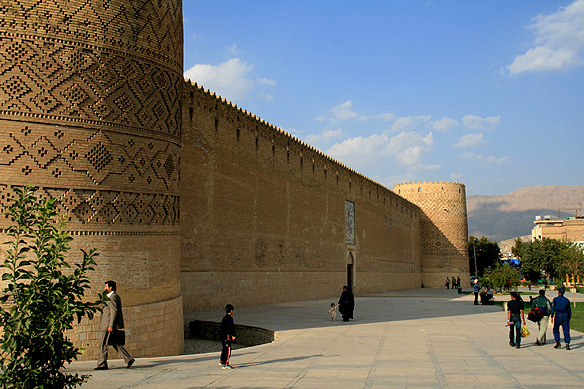 The Citadel from where Karim Khan e Zand ruled during the Zand period has, as its main claim to fame, impressive stucco-work and a tilted tower which competes with the Leaning Tower of Pisa in beating the principles of gravity. 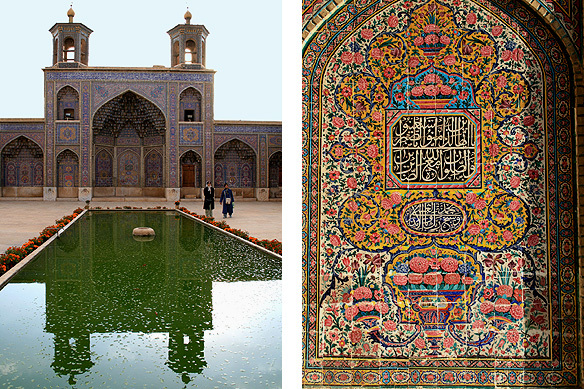 The 19th Century Nasir-ul-Mulk Mosque is exquisite with its pink floral tile-work and calm pools. 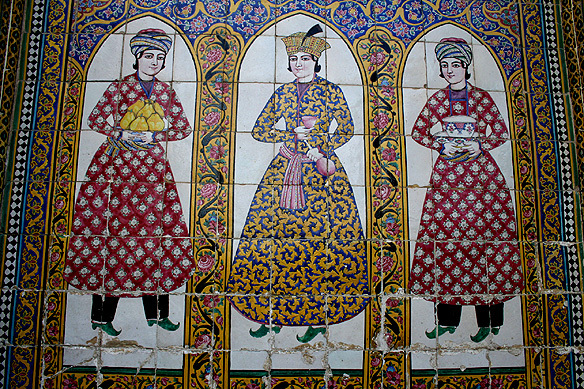 The Qajar period Naranjestan Gardens has the most amazing ceramic painted tiles depicting royal princes and hunting scenes, and mirror-work where one can indulge in self-portraits to one’s heart’s content. 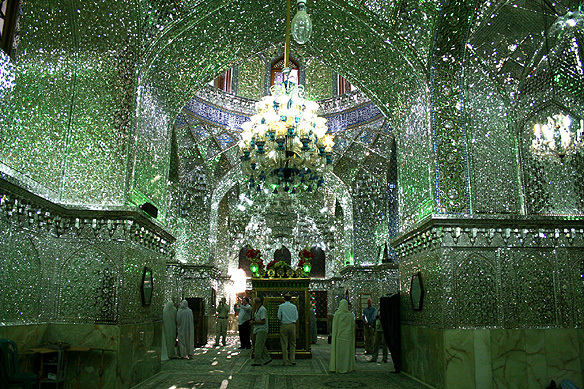 There are Shiite shrines covered in intricate mirror mosaics heady in their ethereal beauty. And there is Hafez’s tomb itself, where scholars meditate on the mysteries of Sufism with tears in their eyes and wonder in their hearts. Occasionally, I would come across a young man or woman with a plaster on their nose. No, they had not got themselves into a fight. It is the proverbial nose job. 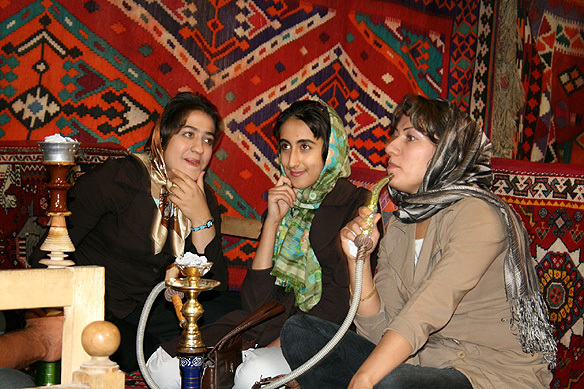 Everyone in Iran who can afford it gets their noses fixed. And at times their lips, eyebrows, cheek bones, and chins. It is a quest to perfect their own beauty. The Bazaar-e Vakil constructed by Karim Khan, as part of a plan to make Shiraz into a great trading center, is the most architecturally impressive in the country. Within the vaulted brick labyrinthine lanes are an eclectic mix of Afghanis, Pakistanis, Persians, Azerbaijanis, Turks and Arabs selling Shiite memorabilia, handicrafts and jeweled trinkets. I bought a handmade ring for a dollar and a half from an Afghani who had lived in Pakistan, was a big fan of Shah Rukh Khan and spoke flawless Hindi. The Citadel from where Karim Khan e Zand ruled during the Zand period. The exquisite 19th Century Nasir-ul-Mulk Mosque. 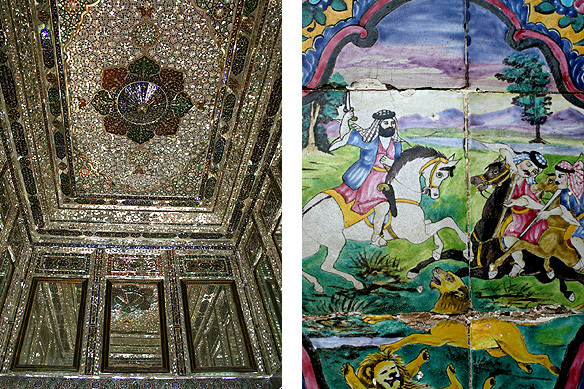 Painted tiles and dazzling glass-work create a heady mix of sumptuousness in the Qajar-era Naranjestan Gardens. Shiite shrine in Shiraz—Glitterati of a different kind. That’s a group of Western tourists around the tomb. The tomb of Hafez, the famed poet, with a fortune-teller at its gate—A little birdie told me what my tomorrows will be like. However, it is in Farsi and I’m happy to live in ignorant bliss! Local Iranians having dinner and a smoke at Yord, a nomadic restaurant set up in tents. This entry was posted in Exploring our World, Iran and tagged Bazaar-e Vakil, Iran, Iranian Women, Naranjestan Gardens, Nasir-ul-Mulk Mosque, Persian Poetry, Qajar Shahs, Saadi, Shiraz, Sufism, Things to see in Iran, Zand Period by Rama Arya. Bookmark the permalink.